Dr. J. Kevin Quaranta (pronounced “Core-on-tuh”) was born in Chicago in 1965. He was raised in Tucson, but attended high school in Palos Hills, Illinois (southwest suburb of Chicago). Dr. Quaranta received his Bachelor of Science Degree from Brigham Young University in 1992 and his Doctor of Optometry Degree from the University of Houston College of Optometry in 1996. He completed his training with Dr. Richard Yee at the Hermann Eye Hospital in Houston, Texas and at Luke Air Force Base Hospital in Litchfield Park, Arizona. He practiced at Southwestern Eye Center since 1997, managing patients pre- and post-operatively, monitoring diabetic retinopathy, treating glaucoma (under the tutelage of Dr. John Lewis), and multiple other ocular diseases and visual conditions. 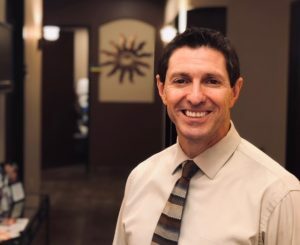 He is currently on the clinical staff at Chandler Eye Center, working closely with surgeon, Dr. Bob Davidson in caring for patients with glaucoma and other eye diseases. He has specialized training in the fitting of scleral contact lenses which allows him to treat patients with more advanced corneal disease, for which no other option exists. Dr. Quaranta’s strengths include his friendly enjoyment of people, his willingness to take the time to understand your expectations and needs, and his years of experience providing intense primary and secondary eye care. For over 19 years he has worked closely with eye surgeons of various specialties, including cataract, cornea, glaucoma, retina, and oculoplastics. He enjoys bringing people solutions to eye problems that will bring them the greatest happiness. Contact Dr. Quaranta using the form below.